Photo (left to right): Union City Mayor Vince Williams, Christian City Executive Vice President George Martin and South Fulton Chamber of Commerce President and CEO Dyan Matthews. 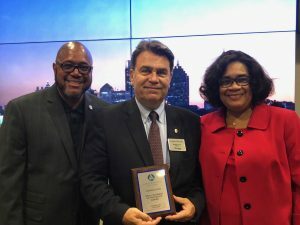 Aerotropolis—The Aerotropolis Atlanta Alliance, in partnership with South Fulton Chamber Of Commerce, is proud to recognize Christian City as its Small Business of the Month for August. Christian City is a unique community operating programs benefitting at-risk youth and others in need near Hartsfield-Jackson Atlanta International Airport. Nominated by Dyan Matthews, president and CEO of the South Fulton Chamber of Commerce, Christian City supports youth victims of abuse or neglect and provides temporary shelter for children who feel they are in danger living on the streets. The organization also offers foster care and adoption program, an independent living community and assisted living facility. Christian City was established as a cottage for abused and abandoned children on Valentine’s Day in 1965. Today, there are more than 1,000 children and senior adults live on the campus, which includes the Children’s Village, homes for active seniors, a thrift store, 200-bed skilled nursing and rehabilitation center, 150-bed assisted living center and two memory care units. Christian City Executive Vice President George Martin said the Atlanta region sees a high volume of children and young adult victims of human trafficking. Union City Mayor Vince Williams also offered his praise of Christian City’s community-focused efforts. Because of their award, Christian City qualifies as a finalist for the Aerotropolis Atlanta Alliance’s Small Business of the Year Award, to be announced at the State of the Aerotropolis luncheon in December.